Ealing Borough Police are appealling for help in identifying a male suspect believed to be responsible for a sexual assault on Grove Road. The incident occurred at at approximately 1.45 am on Wednesday 9th August. The victim, a white female aged 18 years, was returning home after a night out at when the suspect approached her in The Mall, Ealing. The victim ignored the advances of the suspect and continued into Windsor Road and then into Grove Road. He tripped her up from behind and subjected her to a sexual assault. A passerby shouted at the man and the victim escaped into thethe garden of a residential house near Finnegan’s Wake Public House. She did not look back, so is unable to say which way the suspect went. 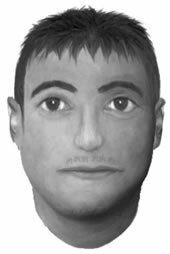 He is described as an Asian or possibly Arabic male in his early twenties, 5' 6" - 5'7" tall with short black hair which had been gelled down at the fringe (see pictured right). He was wearing a dark jacket over a black t-shirt and khaki lightweight trousers. Ealing Police would ask anyone with any information about this incident or who may recognise the suspect from the E-fit to contact The Sapphire Unit at Southall Police Station on telephone number 020-8246-1139 or alternatively Crimestoppers anonymously on 0800 555 111.